Be prepared for puke. Sorry to start with such a gross one, but it really was a stand-out event of the trip - a three time stand out event. Jake threw up twice in the car and once in the plane, and we are pretty sure that all three times it was due to motion sickness. We didn't see it coming at all, but in retrospect we realized there were signs. Usually he's happy to eat anything, especially his favourite snacks, and he wasn't taking any. As well, especially on the plane, he seemed to be crying for no reason. We were so focused on thinking it were his ears bothering him, that we never considered it was his stomach. So! Have a plastic bag and wipes on hand, always have a change of clothes or two available, and look for the warning signs! Bring some (old) new toys. Pick some up at a secondhand store, or pull out some they haven't seen for a while. Select a few small, interesting toys to present during long car rides. One couple I knew who flew to Australia had tiny dollar store type toys wrapped for every hour of the 20+ trip! Go with extended family, if possible. Along with us were my mom, dad and younger brother. It was so great to have all those extra pairs of hands, and that meant we had a chance to do some things on our own as well. Jake loved it too, as there was always someone who was fresh and happy to give him some attention and show him the interesting sights. Involve your toddler in the sightseeing! Don't think just because they won't remember, they aren't worth showing. Jake had a GREAT time watching a fox up close, putting his feet in the ocean, and toddling around downtowns. All brand new experiences he would have missed if we thought it wasn't worth taking the time to show him! Point out little things and big things, tell them where you're going and where you've been. Treat them like one of the adults - it will make them feel great and they will learn so much! Give up your schedule. We have a pretty good routine going here at home, with naps at 9am and 1pm and regular mealtimes and bedtime. Although we tried to make sure Jake got a good amount of sleep, and of course enough food - hardly anything happened on his regular schedule, and this was fine. In fact it was fabulous, everyone enjoyed themselves and we were confident that Jake was still getting what he needed. Now that we're back home, it's back to our regularly scheduled program! Be consistent in your training. This one we've learned the hard way. Jake basically returned from the vacation having forgotten the rules that keep him safe, healthy and happy. One week of basically having a free-for-all, with few consequences, seems to have temporarily (we hope) undone the training we've been working so hard at. So our advice to you - remain consistent. 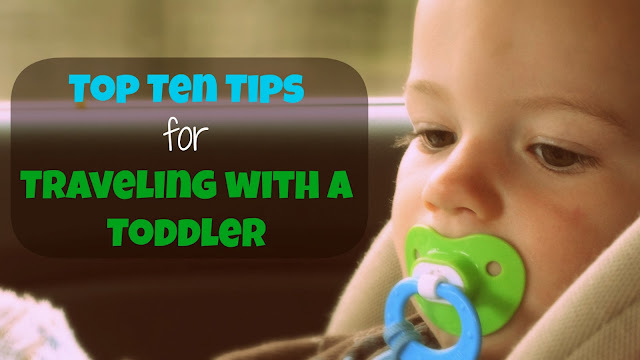 It may be harder, and sure you want there to be considerations for it being a special occasion, but make sure your toddler knows there are still boundaries in place. Maintain a close walk with God and your spouse. It is easy to get caught up in all the activities of a vacation, and put aside your relationship with God and your spouse. Make sure you take time to come to the Lord as a family, in prayer and Bible reading, as you would at home. And also take time to nurture your relationship with your spouse. Remember - your marriage is the foundation of your family, so keeping it strong is one of the best things you can do for your toddler! Whatever happens, don't panic! If you forget the soother - you can always buy one! If you run out of diapers on the plane, find another young mom and ask her for one! You're covered in puke? Nothing a shower and a change of clothes can't fix! It rains the whole week? At least you're enjoying the rain as a family! Whatever your vacation throws at you, remember that it's probably not worth fretting over. Take pictures and rest assured you will certainly laugh about it in the future! Share your tips for traveling with children in the comments below! I'm glad you had a great trip with your little one! Such a good post!! Very needful as I have a toddler too. :) Blessings! I agree with you that the tips is the top tips for vacation with toddler. Yes, go for vacation with toddler being a challenge, because we have to give full attention for him. Thanks for sharing.